Ice Carve Pro Lathe – Manual. 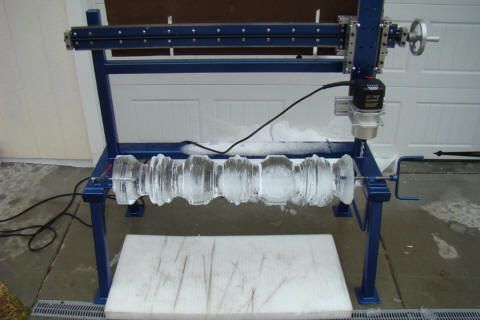 This lathe was built and designed to turn 10”x10”X40” pieces of ice into ice columns, flower vases or pedestals. The ice lathe comes with a Porter Cable 3 ½ HP Router motor and three lathe patterns. The Router motor only turns the cutting bit. The ice must be turned by hand. The clockwise movement of the bit will helps turn the ice, but the operator must assist by pushing on the ice when it slows down.